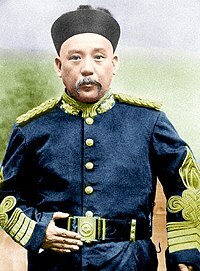 English: Yuan Shikai (1859–1916) — a Chinese general, politician, warlord, president, premier, and emperor. Famous for his influence during the late Qing Dynasty, his role in events leading to the abdication of the last Qing Emperor, his autocratic rule as the first President of the Republic of China, and his attempt to restore monarchy in China, with himself as the Hongxian Emperor (1915–1916). Media in category "Yuan Shikai"
This page was last edited on 31 July 2018, at 23:34.